Are mosquitoes able to bite through clothes? What if you have a tiny bit of bad luck and you have gotten a mosquito bite on your leg? But that’s strange… You were absolutely sure about wearing jeans (pretty solid pants) pretty much all day long. Are these blood-lusting insects able to bite through your jeans, leggings or yoga pants as well? It certainly would seem so. I’ve been more than determined to sort this problem out for you, and I’d be happy to share what I’ve learned! Last night it happened to me. My legs turned red and itchy: You know the drill. One of those nasty buggers got me good, and I didn’t even feel the mosquito bite at all when it happened. I mean, my trousers aren’t watertight or anything, but it would seem strange to me if mosquitoes would be able to pierce their way through cotton or polymers that effectively. So it made me wonder what type of pants or leggings are actually vulnerable to insect bites. Not that I’d like to wear leather pants or anything, but at least wear something slightly fashionable without getting stung into oblivion. Let’s start with the most common leg wrapper, the good old-fashioned, sturdy and basic jeans. Mosquitoes will bite through thin clothing, so in order to protect from mosquito bites, it helps to wear thicker pants. Before a bite, mosquitoes perform “probing” to bite their victim: They “poke” to get through clothes. 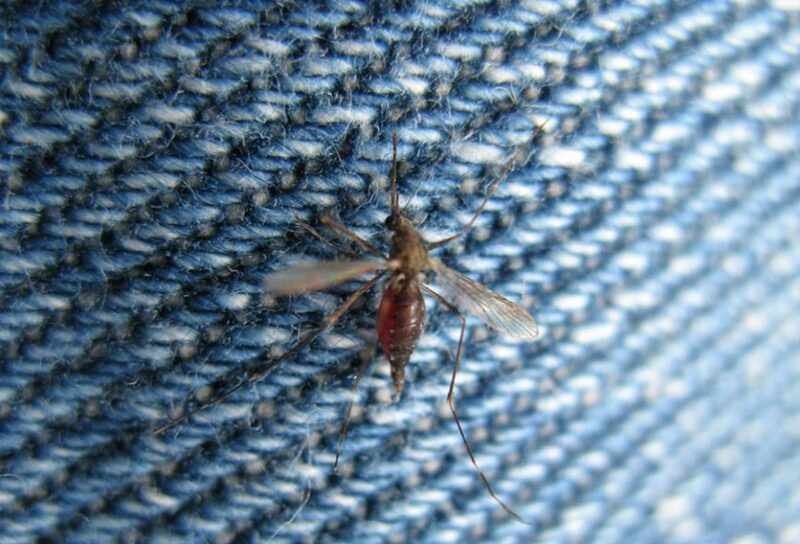 Jeans are vulnerable to probing, so mosquitoes can indeed bite through them. Similar probing behavior occurs for other types of clothes, such as socks, t-shirts, sweaters and even shoes. Not all of these materials will fall victim to the act of probing, since some clothing can be thick enough for a mosquito to not reach the skin (or bloodstream). While jeans might look sturdy and thick, their method of weaving makes it possible to penetrate it with a tiny stinger. The mosquito will look for the path of least resistance, between herself (mosquitoes that want blood are female) and the victim. But there is good news as well: Not all individual mosquitoes are strong enough to probe through sturdy denim material. So do check those mouth muscles on your mosquito before deciding whether or not to make a run for it. All jokes aside, it’s probably the best idea to just get rid of mosquitoes that land on your jeans, regardless of their strength. But let’s look at some other types of pants as well. Yes, mosquitoes are able to easily bite through tight leggings. The fabric will not stop a mosquito from probing through the fabric and enter your bloodstream. The materials used to produce leggings allow for some wiggle-room, which is enough from the small proboscis a mosquito uses to bite someone. The proboscis isn’t merely similar to a small spear, able to pierce through different clothing fabric types. It will also use the six thin and needle-like mouthparts to wiggle around for the right amount of space to enter the skin (even when moving straight through your leggings). Yes, the mosquito bite is a sophisticated and evolved process. Most people will not realize it, but most regular types of pants and leg fashion will not stop most insects from biting you. You would need a thick leather to protect yourself, yet this would be very unhelpful in terms of draining body heat and sweat quickly. So whether using leggings or even yoga pants, you’ll most likely end up with an itchy red bump on your leg. However, yoga pants might have one small exception. Can Mosquitoes Bite Through Yoga Pants? It depends on the exact type of yoga pants, if mosquitoes are able to bite through them. If you wear wide yoga pants, the empty space filled with air can be enough to stop a mosquito from biting you. If you wear tight yoga pants, the effect will be stronger than leggings, since they are thinner than those type of pants. The simple truth to the pants concept is this: If there is a way, the mosquito will find it. You can’t arm yourself against insects that are determined to bite you, which makes it rather challenging to clothe in a way that deters a bite. We don’t want to walk around in an astronaut suit all day, so it is probably better to just take the risk. Avoid evening or night activities if possible. How Many Times Can Mosquitoes Bite? 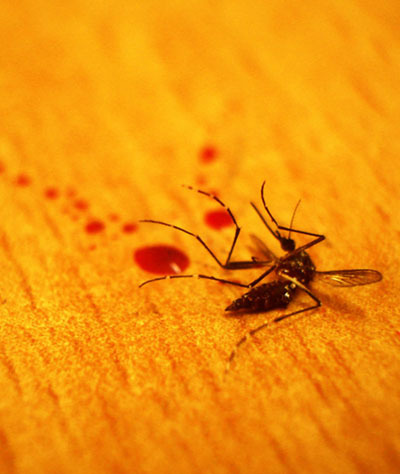 It depends on the amount of blood a mosquito has ingested, how many times it might bite a person. Mosquitoes are known to bite people multiple times in a row, up until they have ingested three times their own body weight in blood. The chance of biting multiple times increases if you are indoors in your (bed)room. The biting habits of a mosquito will not be stopped by clothing either. If you wear jeans, leggings or pants: The female mosquitoes will find a way to attain their goal of sucking your blood. It’s a good idea to install some counter-measures, especially in the summer period at night, when the mosquitoes are at their most active of the entire year. Let’s take a quick look at some of the most effective counter-measures you can take in your house, for mosquitoes to be either distracted enough to not bite you, or outright hate you because you used some very effective anti-mosquito products. I’ve battle-tested some of the most effective repellents out there, and would certainly like to share some solutions with you. How Do You Get Rid Of Mosquito Bites Quickly? Getting rid of mosquito bites quickly can be done in two ways: Through prevention or effective bite treatment. How most people do it is after the bite occurred, however, the most efficient way is to avoid getting bitten in the first place. You want to get rid of bites by removing the itch (using an ice-pack) or avoiding the swelling (using lotion). For both preventive measures and bite treatment, I’ve tested and reviewed most of the popular products out there. You can find most of my best product picks for bite treatment (and prevention) on this useful blog page. I highly recommend you to check it out, because these are the tools that have helped me to get rid of my mosquito problems in a cheap and effective way. If you’re unsure about spending some money on a reliable anti-mosquito product, you can also try some DIY homemade solutions. As mentioned, you need to avoid alcohol use (especially beer) around mosquitoes, or you’ll likely get bitten. This is because insects are drawn to the smell of alcoholic beverages such as beer. You can use an empty soda bottle, some tape and some leftover beer to do the trick. Check out the full explanation in this blog post. I call it the “Mosquito Beer Trap”, and it works really well.